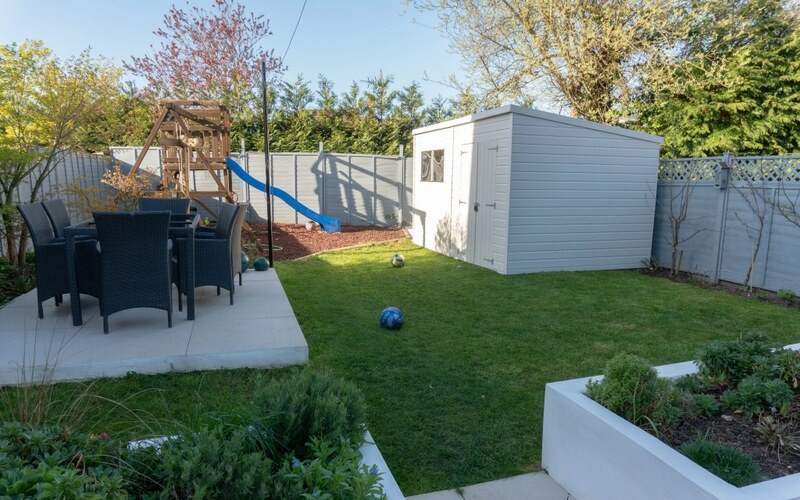 I never realised I would be so happy about a garden shed! But it means we’re one step closer to our house extension! 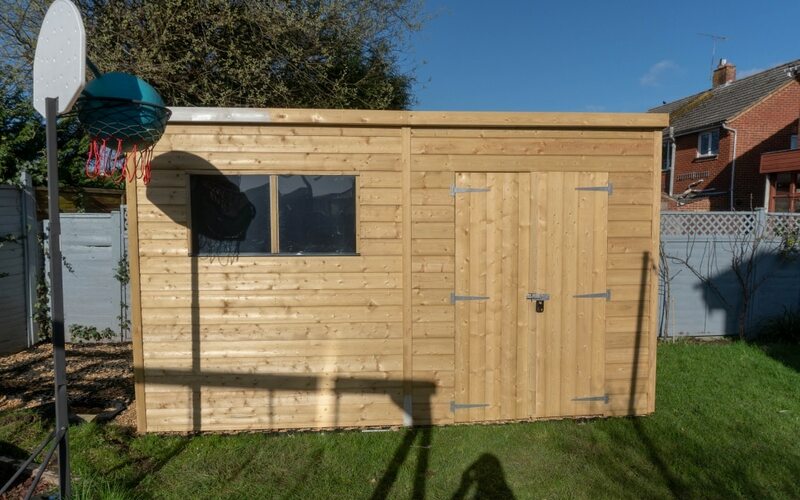 Demolishing the garage means we lose all that storage space that we need, so a shed had to be built in the garden. We’ve worked so hard on our garden over the past couple of years that it took a while for me to decide what shed I wanted. 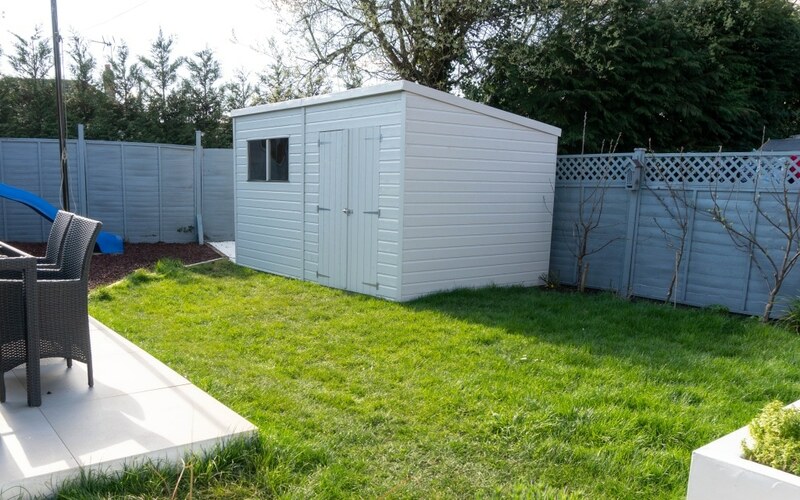 I even created a blog post with tips on buying a shed! 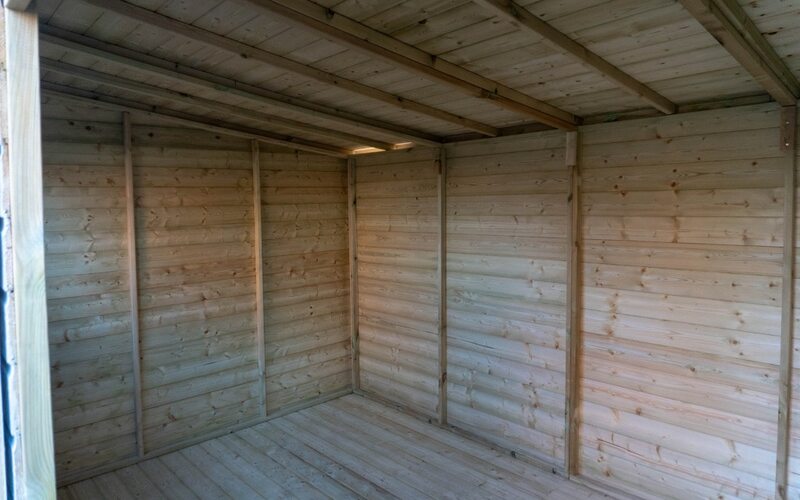 Once I had decided that the Waltons Pressure Treated Pent Shed would be acceptable in my garden I couldn’t wait for it to arrive. 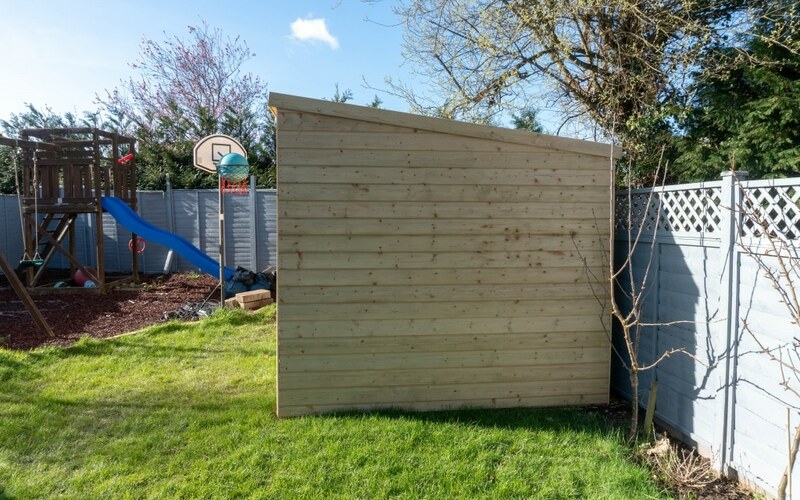 I was going to grow a beautiful climbing rose up the side of it to hide the big wooden side and I was going to paint it in a paint that would coordinate with the fence panels! * I received a discount in return for this review. Delivery was super quick, you can pop in your postcode to see when Waltons can deliver your shed and mine was about a 2 day delivery at the time. I was very impressed, no waiting around for it to be built with a long lead time. 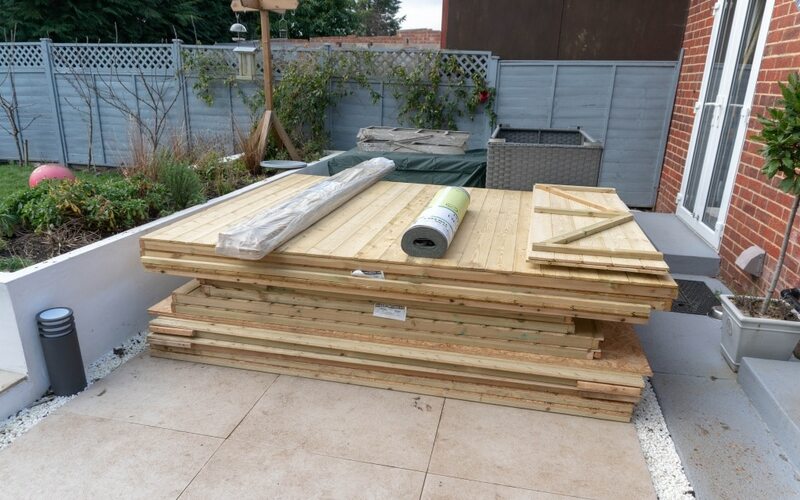 Delivery was free and the man with a flatbed lorry arrived with the shed. 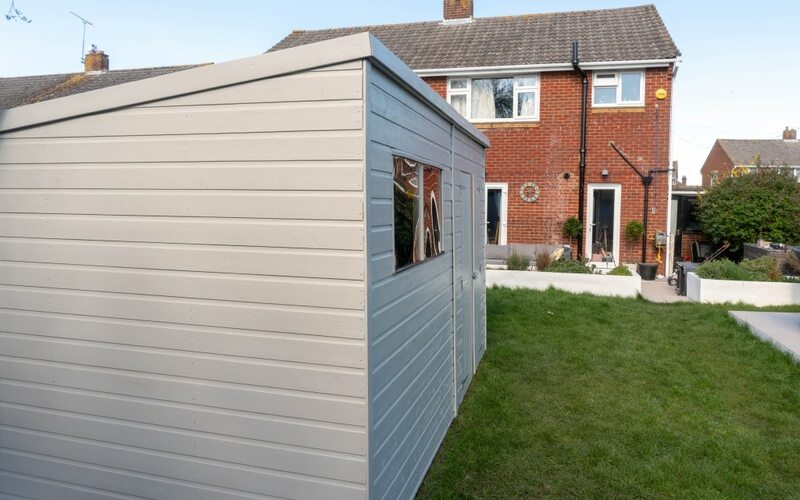 He got on and placed the shed in the front garden, for us to bring through to the back garden. 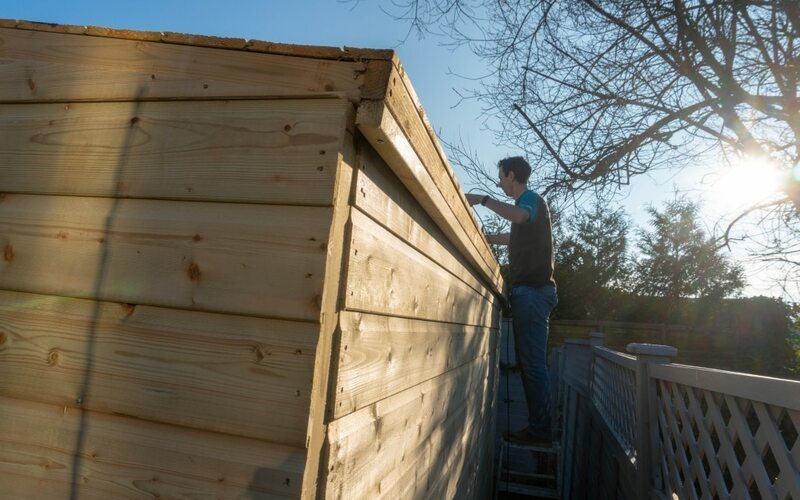 Make sure you plan on how you’re going to get your shed into your back garden! We did have to ask the neighbours can we go around their side and over our fence to get it in the garden! It was the last two end pieces that wouldn’t fit through the house doors. 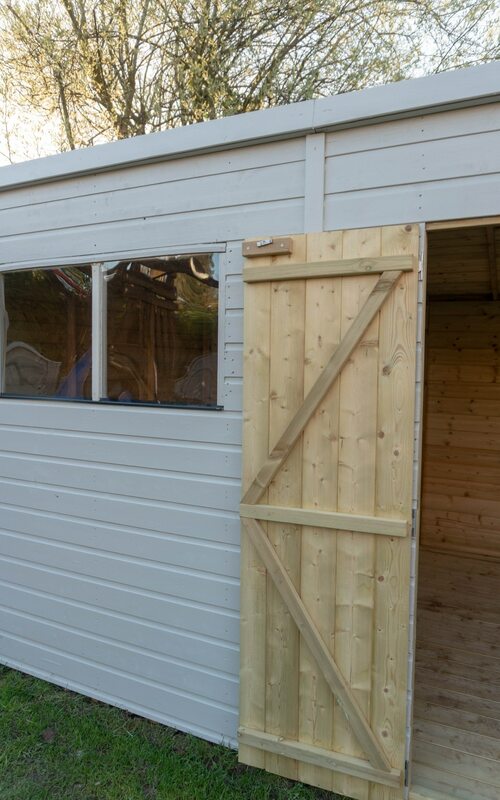 Straight away I was very impressed with the quality of the shed, we did pay extra for the tongue and groove floor and roof pack and I am glad we did. It all seems to be so solid and strong. We also knew we wanted to have pressure treated shed as this means it should weather better and last longer. We’re going to use this Waltons shed for a lot of things. I am sure my husband is going to put an armchair out there at this rate! Make sure you have some help! A lovely friend of ours came over to help Kev install the shed and boy did he need him! It’s a big shed with some large panels to hold up. At one point to make it easier on Kev there was four of us holding a section up whilst he went around a screwed them together! It took two of them around 6 hours to build, with some tea breaks! 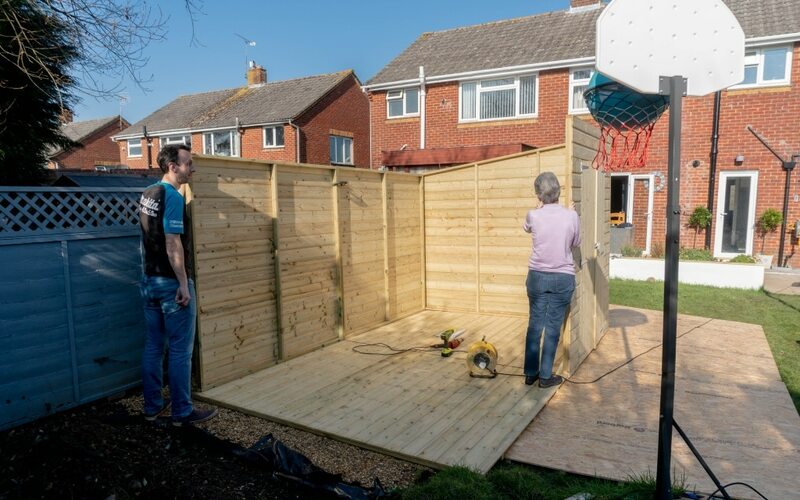 Kev was being careful though to make sure he was doing everything correctly as he had never installed a shed before. 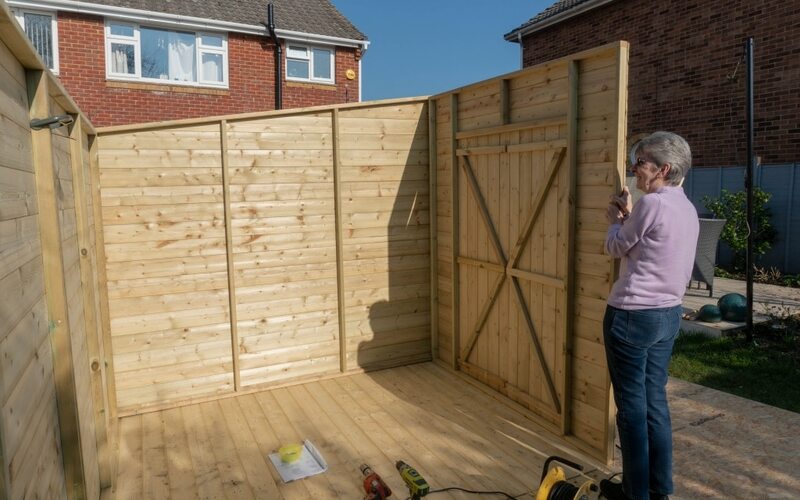 Also make sure if you’re pushing your shed up against a wall or fence, finish off that side before you push it into place. You need to access all sides to fit the roof and it was a bit of a squeeze behind here! I should have painted it before it got pushed back! 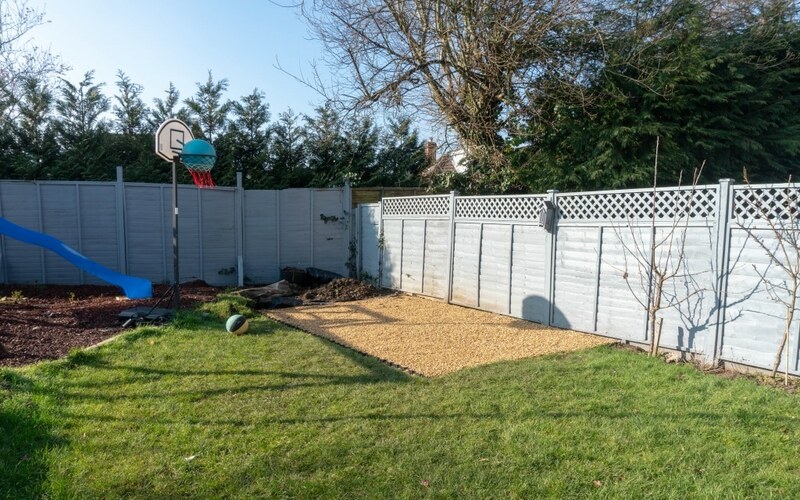 We installed the shed on a plastic shed base which we were very impressed with too, creating a well-draining base for the shed to sit on and very quick installation. The windows are not made of glass which for us as a family garden is much safer. 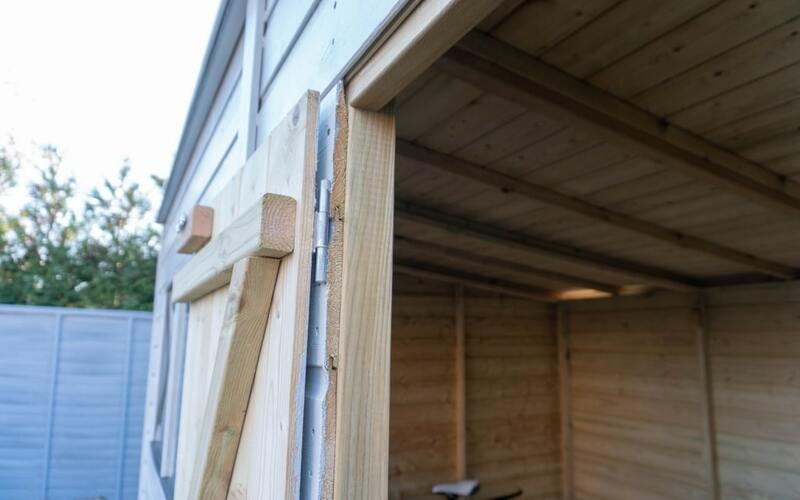 We upgraded to a tongue and groove roof pack to make it more durable and stronger, and the shed came with mineral felt which seems tough enough. Be very careful when you install it not to rip the felt as there is only just enough to cover the shed. 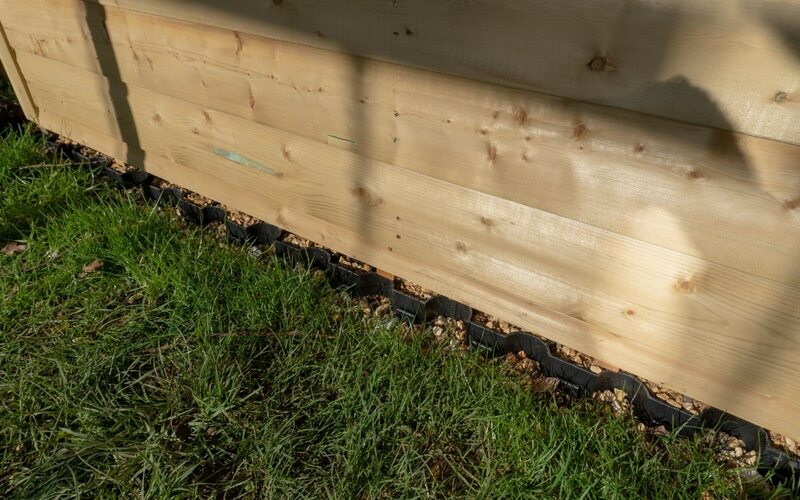 I loved the Waltons shed had fascias around the top meaning the roof felt was folding and hidden into these, creating a nice edging. When installing the doors they come with all the hinges and bolt. 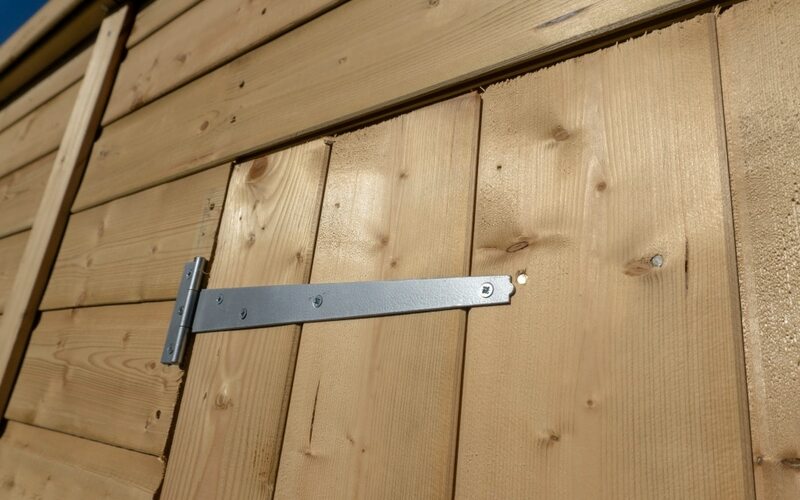 There are no guidelines on where you need to screw these into on the door, make sure you line them up with the batons that are the other side. Otherwise, you end up with a lot of little screw heads poking out on the inside of the door. 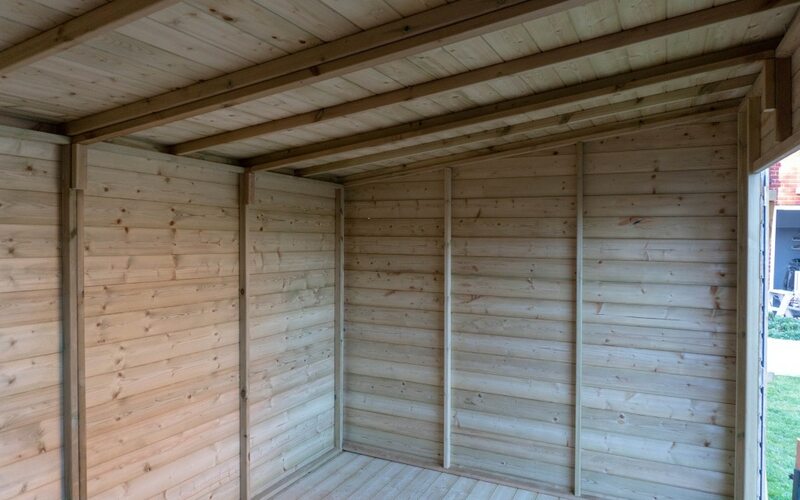 With a pent shed, you have a higher pitched roof at the front than the back. 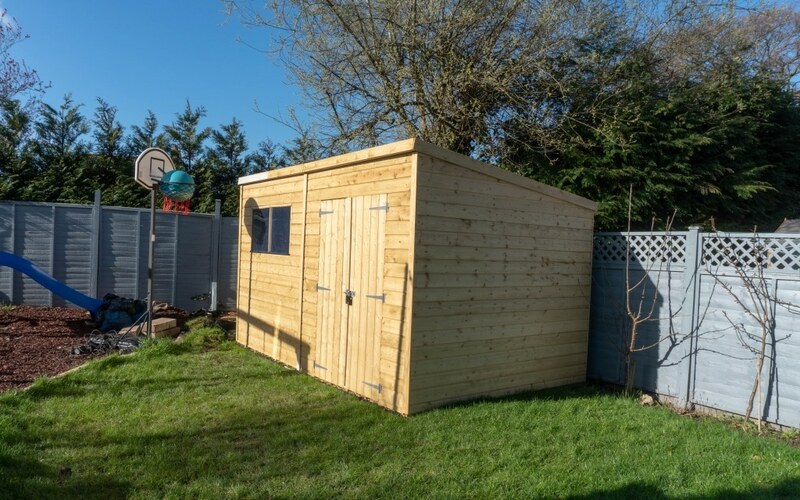 Check the measurements on the Waltons shed website to see if it suits your needs. 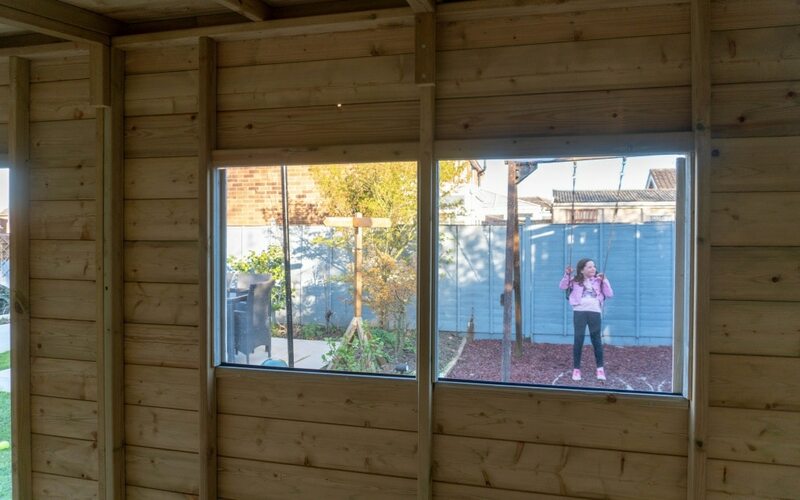 I love the layout of this shed, as it meant from my house I can’t see all the doors and windows. I can only see one end, and this end I will be growing climbing rose up it to hide it more. 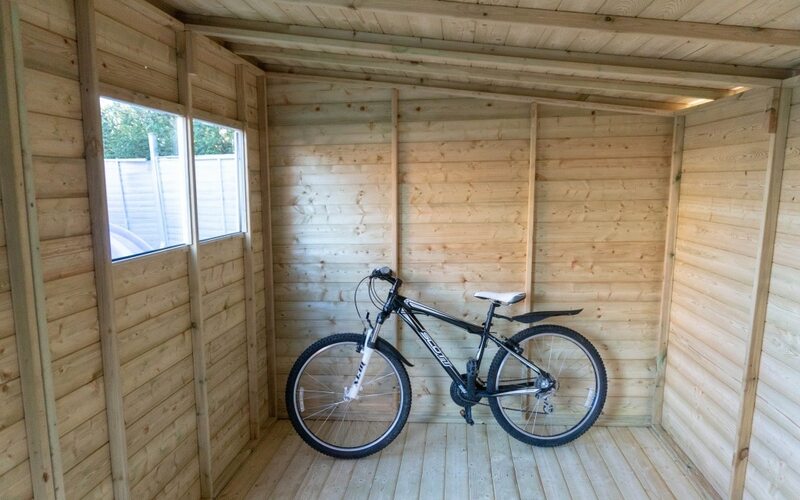 I have placed my sons small adult bike at the end of the shed to give you a size idea. So you’ve seen I decided to paint my Waltons shed, pretty much everything wood in my garden has been painted and I love it! I used Johnstone outdoor colours in Calming Stone. This is such a good paint and it really protects the wood. 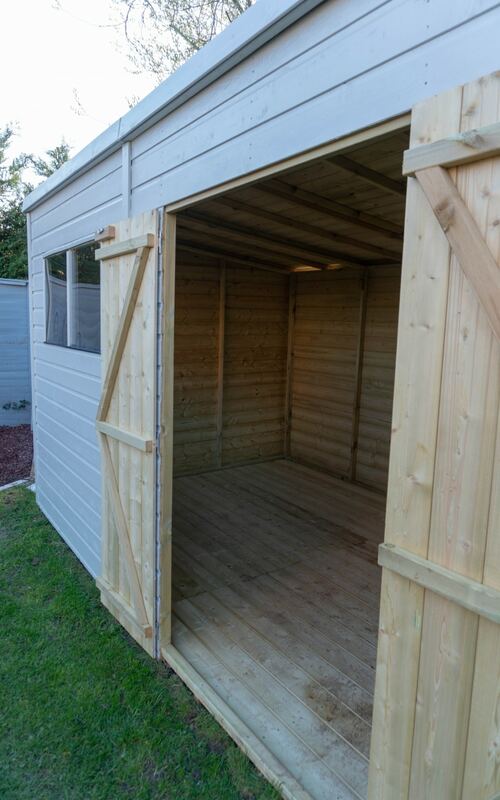 We are over the moon with this shed, the quality is amazing and it feels really secure. It even handled a strong storm we had about a week after it was built and had nothing in it. 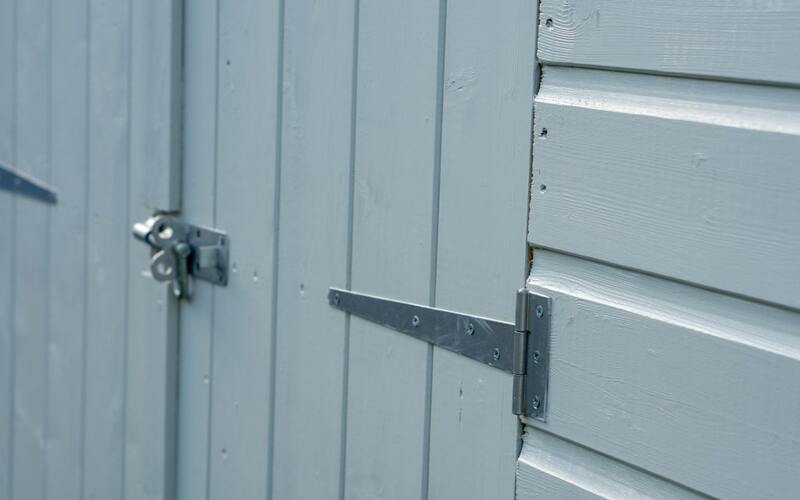 Waltons offer a 15-year anti rot guarantee on this shed, and I think that alone shows you how confident they are in their own sheds. I would happily order from Waltons again. *I received a discount in return for this review. Luckily my husband is happy with everything painted!! lol! It looks like you did a great job assembling and painting it. It looks a really good size. Its a super size, lets see how much we can fit in it!! Such a grown up subject isn’t it! I couldn’t leave it a normal colour, could I!! If we ever live anywhere with our own garden I totally want a shed. As my own private hideaway though, not for storage, lol. I would love a summer room up in the garden now, this is so nice to be in and not all yucky! I’m not going to let hubby make it a mess!! Ah that’s a lovely addition to the garden. So spacious too! Our garage is so full of stuff I just don’t know what we’d do without it! It would require a lot of decluttering if we were to have to empty it! Yes we’re not looking forward to emptying the garage, but at least it will give us a good clear out! That’s a beautiful shed! We’re going to need a new one next year hopefully so I’ll keep this in mind. Ah cute, my kids have been running in and out of this like a playhouse! Their be disappointed once it gets filled up! Great blog. We have a wood shed completely on its last legs so will definitely look into this.